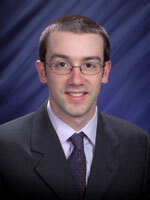 Dr. Sebastien Kerisit has been selected as the 2005 recipient of the M.T. Thomas Award for Outstanding Postdoctoral Achievement. This award is in recognition of his accomplishments that include seminal and novel theoretical advancements in understanding electron transfer reactions at environmental interfaces and their impact on the field of geochemistry. The award acknowledges outstanding accomplishments by postdoctoral fellows who conduct their research in the William R. Wiley Environmental Molecular Sciences Laboratory (EMSL).